One Lucky Day: Baby It's Cold Outside! 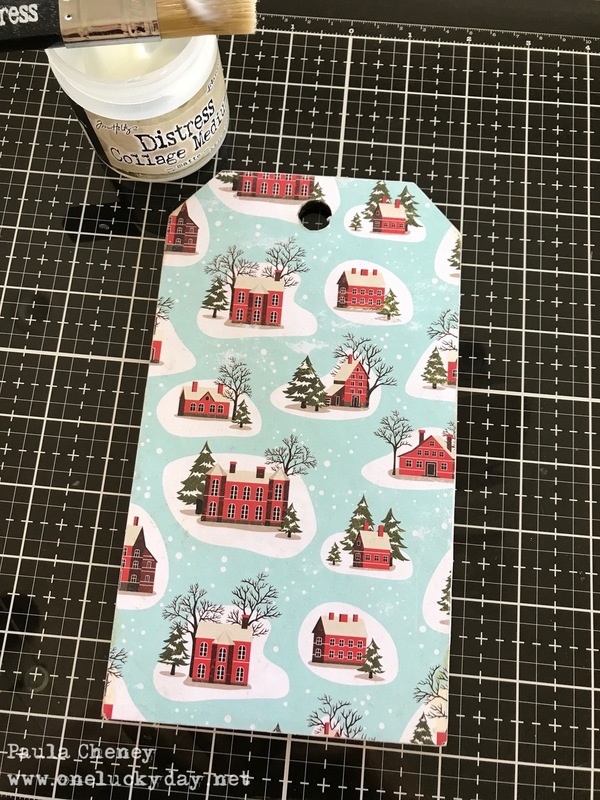 Popping in with a fun Christmas project today. I can't stop painting Salvaged Snowmen so I decided I better start making a few projects to use them on! 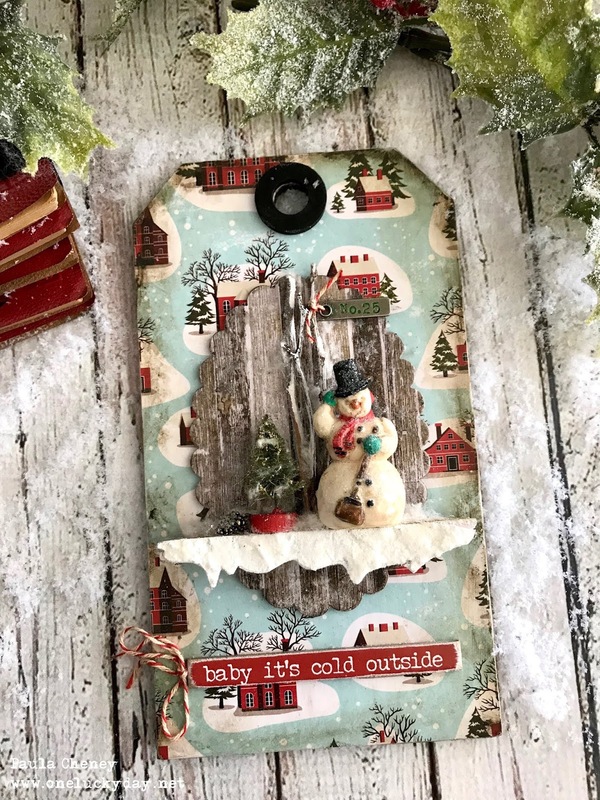 I have used a Mini Etcetera Tag to create my little Christmas scene. Follow along and I'll give you a few tips on how I made it. 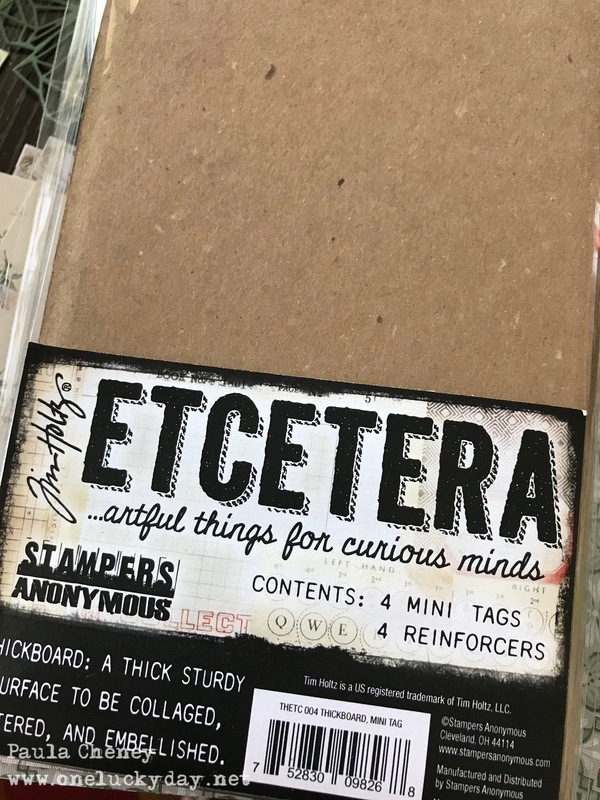 As I said, I used a Mini Etcetera Tag as the substrate. I love this size and the fact that you get four in one pack. I covered the tag with one of my favorite papers from the Christmas Paper Stash. I also added a coat of Collage Medium over the top of the paper as well to seal it. 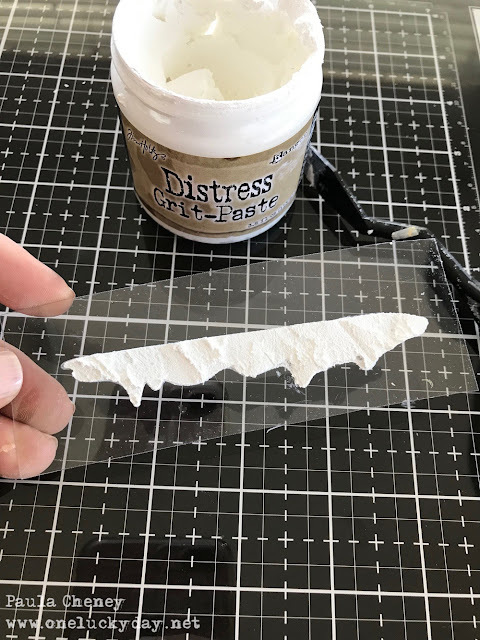 While that is drying, I cut a piece of packaging plastic and gather some supplies. 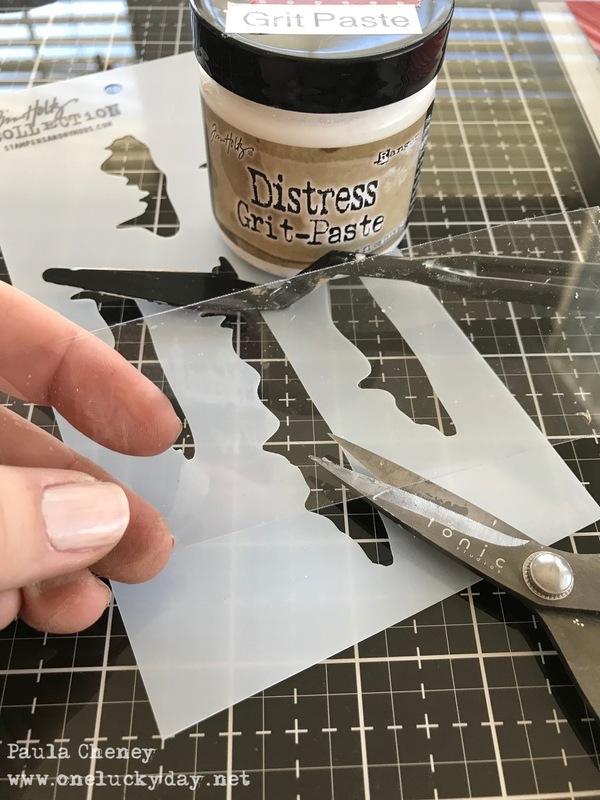 Grit-Paste, a palette knife and the Snowcap Layering Stencil. I placed the plastic under the stencil and added the Grit-Paste in a rough manner. So that when you remove the stencil it looks like snow! Now to set aside to dry. 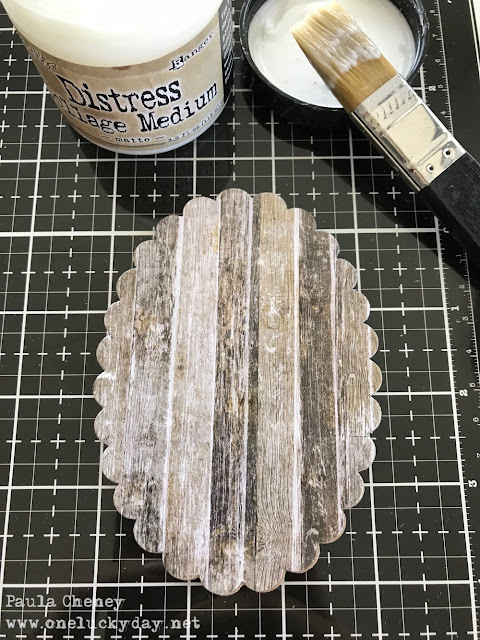 While the Grit-Paste is drying, I used the Sizzix Oval Framelit to cut two pieces - one thin chipboard, one woodgrain paper from the Christmas pad. I sandwiched them together with Collage Medium. Then for a very subtle look, I used Texture Paste - Transparent for the stars. 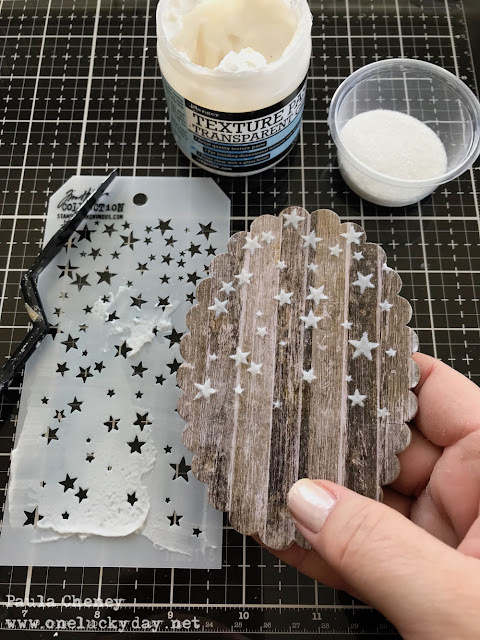 Once dry the glue will be transparent and only the Rock Candy will show. 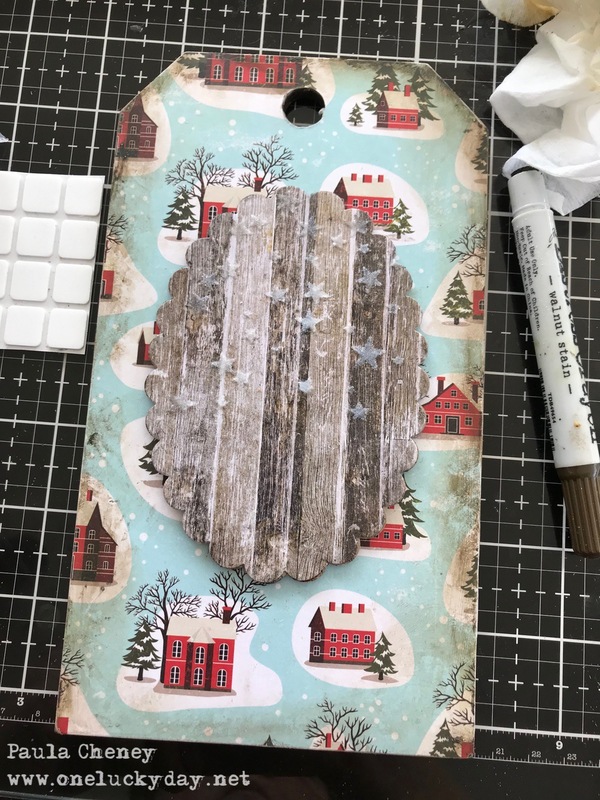 I used Distress Crayon on the outside edges of the tag and added the center oval with Foam Squares from Scrapbook Adhesives. 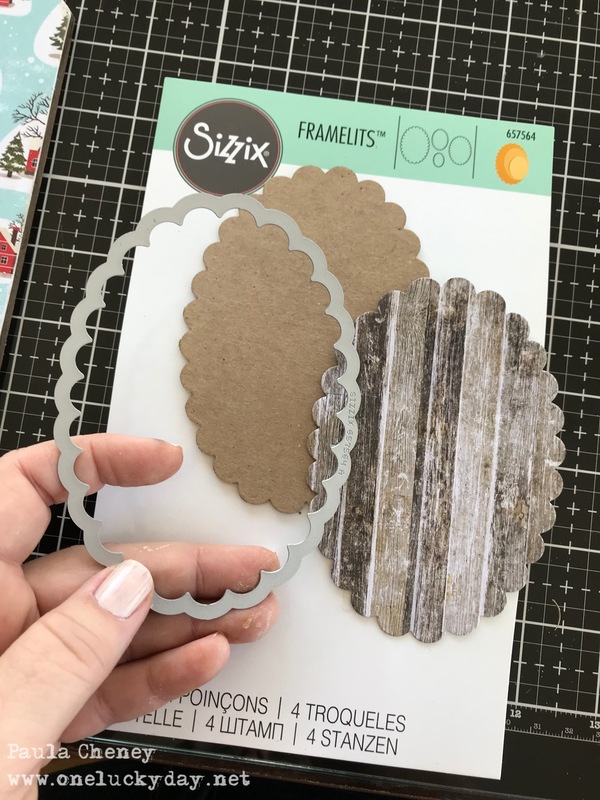 The ledge was created by sandwiching two Ruler Pieces together (I cut them to size individually first) and using Collage Medium to set it in place. Worked like a charm! I also cut out the snowcap I created earlier and added it to the front of the ledge with Collage Medium. One thing you won't notice in the picture is that I sanded off a bit of the snowman's booty so he sits flat against the back. I used a face mask since he's made of resin and just rubbed it back and forth over the sand paper a few times. This also helped him to fit on the narrow ledge much better. This is a much better shot of the center. The ledge and the snowman are securely attached. I used some twigs from the garden to create a little scene in the back. White paint on the trees give them the appearance of snow. A little added Collage Medium so Rock Candy Glitter could be added. I colored the Story Stick with Mowed Lawn Distress Crayon and added it to the scene with a Foam Square that had been trimmed. I used a small brush to add the Distress Paint colors to the Snowman (Candied Apple, Black Soot and Evergreen Bough) and then let him dry. I scribbled a bit of Walnut Stain Distress Crayon on my craft sheet and picked it up with a damp paint brush so I could paint it over the body to age it. Once dry I added Glossy Accents over the top and sprayed Clear Rock Candy over the body using my Glitter Duster! I created the "snow" for the ledge using my scratch tool and a small pieces of Warm and Natural (cotton batting sold in fabric stores). Cut small pieces and scratch over it till it shreds and becomes fluffy. 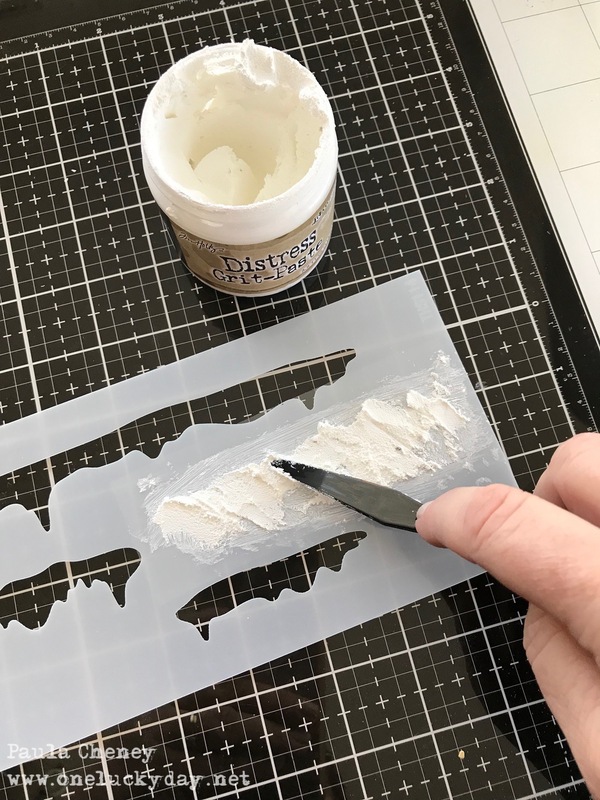 Add the glue to the surface and then place the "snow" over it. 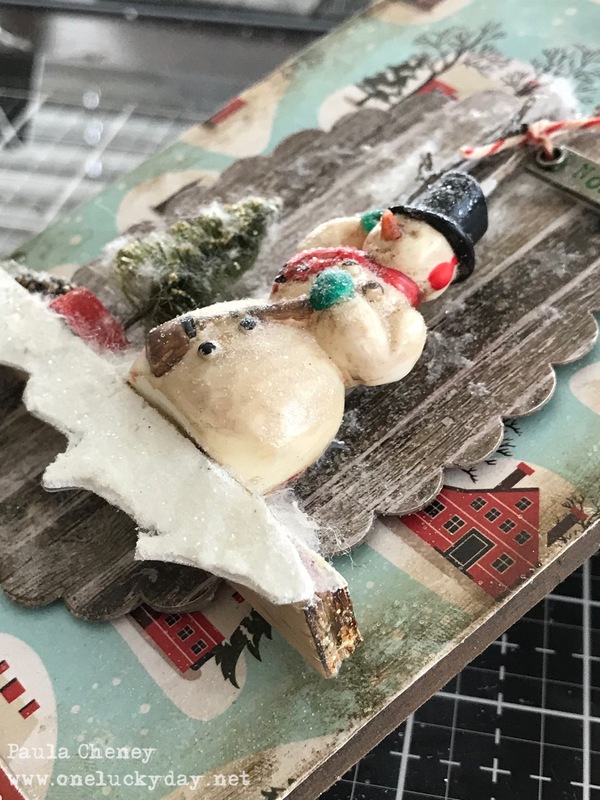 I have also added wisps to the twigs and used my Craft Pick to push it into the tiny tree. I love this little tag - it would be an easy gift to make for a friend or neighbor and since the tags come in 4's and the snowmen come in 2's it's easy to create more than one. 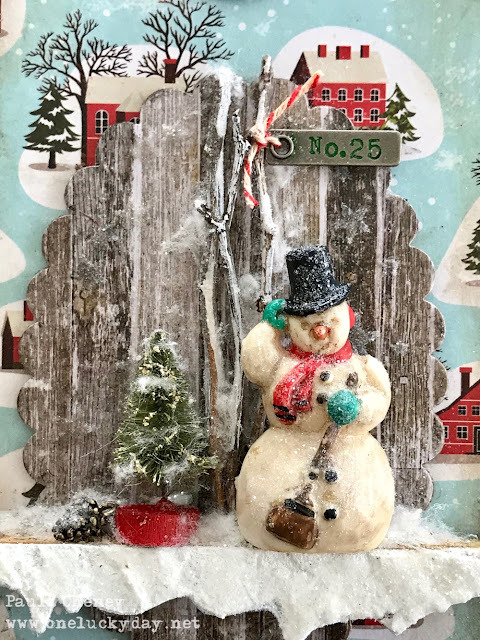 I tell you once you paint the Salvaged Snowman you just want to paint another! You know that I LOVE this!!!! 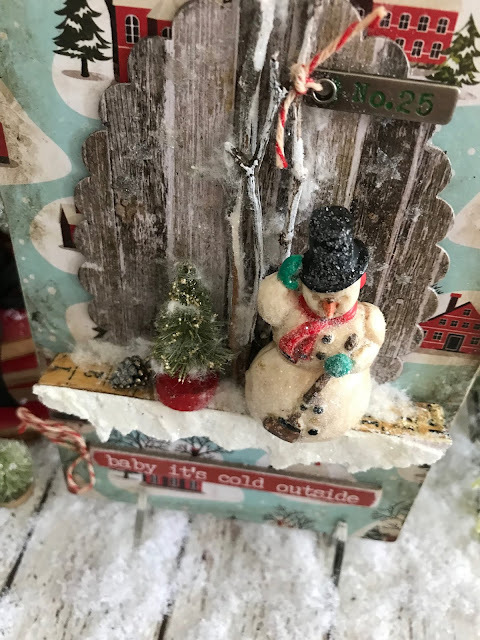 That little snowman has my heart and your project right along with it! ❤️ Super adorable, Paula!!! Clever, clever, clever! This is totally adorable! Gorgeous and clever! 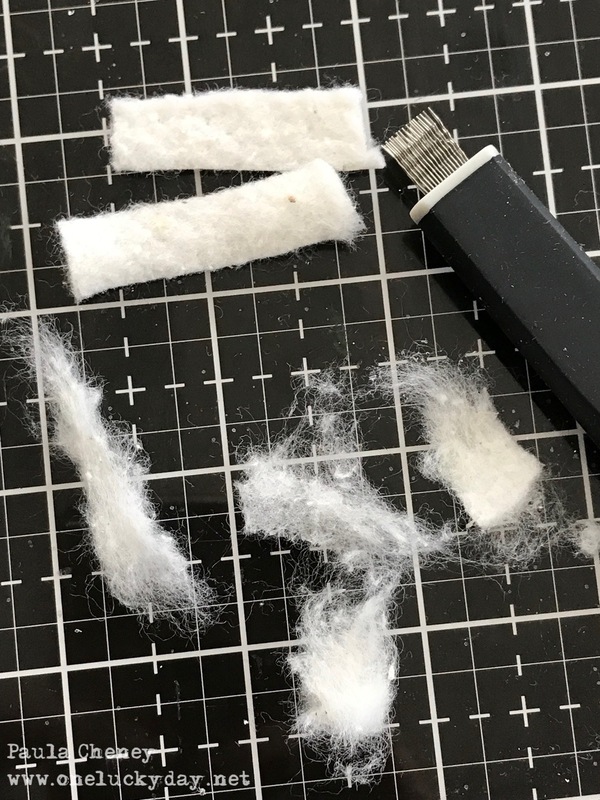 Thanks for all the making tips; so generous of you to share! Love the little snowmen and all the ways they've been used this year! Thanks for your inspiration and tips. This is so charming Paula!! I love it! Thank you Paula for your great teaching and showing the steps to your art. You help each of us develop the skills to create our own art. Love this! What a great gift idea. TFS Paula! Always love your wonderful projects, and your instructions and photos are perfect. Thanks so much for sharing. wow that is just outstanding, all your little touches make for a wonderful creation! This is so cool, Paula. You are so creative. Thank you! Adorable!! Love your tips you shared. Love, love, love this tag and your creativity! Love it! A favorite for sure. I love this, Paula!!!! Every detail. It's wonderful how you made the snow and the ledge and the hanging snow at the front of the ledge!!! Hi Paula! A very inspiring project and your instructions are easy to follow. Great creative work as only you can do. :-) Hope to take a class soon. Merry Christmas to you, my dear! WoW, what a beautiful tag! The snowman is amazing, love the detail of him and the entire tag. All the nonsense on this song.. I digress. Love your snow guy on the shelf and all the snow. The plank background is too cool against my new favorite paper too. Love this one!!! 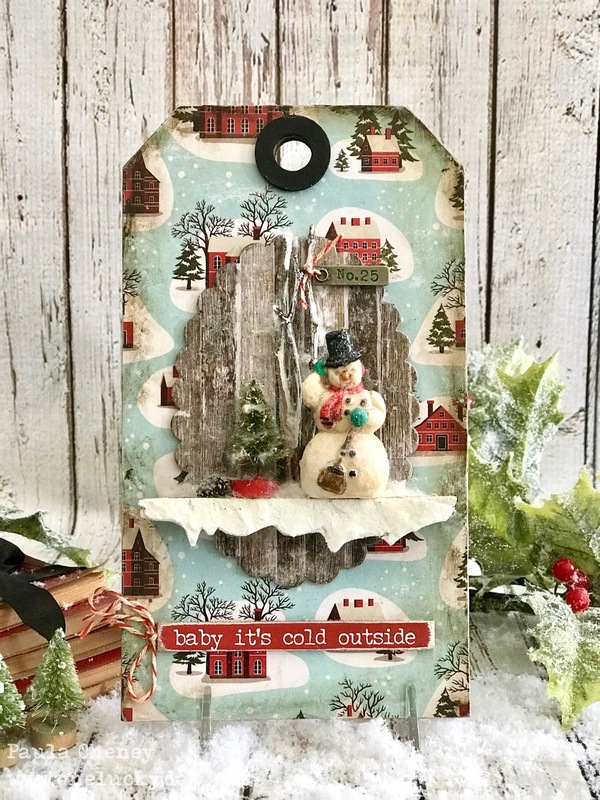 Just finished my version of this tag from your inspiration. It has been cold in the extreme where I live in NE Wisconsin with temps at -50F with the wind chill so frosty days are the norm right now. It warms up long enough to snow and then goes into the deep freeze again. Love painting the snowman. thanks as always for sharing.